BALDACCHINO. On January 22, LOUIS, founder of Classic Press, Cospicua, aged 82, passed away peacefully comforted by the rites of Holy Church. He leaves to mourn his loss his children and their respective spouses, his grandchildren and great-grandchildren, all other relatives and friends. The funeral leaves Mater Dei Hospital on Friday, January 25, at 1pm, for Our Lady of Mount Carmel parish church, Fgura, where Mass præsente cadavere will be said at 2pm, followed by interment in the family grave at Santa Maria Addolorata Cemetery. Lord, grant him eternal rest. CARUANA. On January 21, HENRY, aged 81, went to meet the Risen Lord and to join his son Sandro and others he loved. He will be deeply missed by his wife Laura née Bisazza, his son Claude and his wife Nisha, his son Leon and his wife Clara, his adorable grandchildren Amy, Julia and Samuel, his dedicated carer Leth and many relatives and friends. The funeral leaves Mater Dei Hospital on Thursday, January 24, at 9am, for Mary Immaculate Mother of the Church parish in Ibraġ where Mass will be celebrated at 9.30am followed by interment at Santa Maria Addolorata Cemetery. No flowers by request but donations to id-Dar tal-Providenza will be greatly appreciated. Lord, grant him eternal rest. GRECH. On January 20, at Mater Dei Hospital, PAOLA of Vittoriosa, aged 83, passed away peacefully comforted by the rites of Holy Church. Lovingly remembered by her children, Joseph and his wife Anne, Sylvana and her husband Leo and Austin and his wife Claire, her grandchildren Daniel, Adam and his fiancée Jessica, Amanda and her husband Stan, Denise and Celine, her great-grandchildren Lucas, Eliza and Nathan, her sisters, and her brothers-in-law and sister-in-law, all other relatives and friends. The funeral leaves Mater Dei Hospital tomorrow, Wednesday, January 23, at 7.45am, for Our Lady of the Annunciation church, Vittoriosa, where Mass præsente cadavere will be said at 8.30am, followed by interment at Santa Maria Addolorata Cemetery. Lord, grant her eternal rest. MUSCAT. Suddenly, on January 20, perit TONY MUSCAT, at the age of 72, comforted by the rites of Holy Church. He leaves to mourn his terrible loss, his dearly beloved wife Elspeth, née Borg, his much loved sons Duncan and Claudia, and Keith, his sisters, Margot Briffa and Ina Debono, his brother- in-law Tony Cassar, his nephews and nieces, Noel and Nigel Cassar, Nikolai, Kristjan and Karl Briffa, Miguel and Anatole Debono, and their respective families, his sisters-in-law, Nancy Gulia, Marcelle Busuttil, Marlen Micallef, Maris Zammit and his brother-in-law Robert Borg, and their families, his nieces and nephews-in-law, Myra Tilney, Gaby Torpiano, Cindy Chapelle, Bill and Ronnie Busuttil, Paul Micallef Jnr, Marcelle Moore and Sandra Sullivan and Michael Zammit and their respective families, relatives and so many friends. Funeral arrangements to be announced tomorrow. Tony touched so many hearts. Lord, grant him eternal rest, which he so richly deserves. SCIBERRAS. On Monday, January 21, at Mater Dei Hospital, ANTHONY (Ninu ta’ Ġilormu), of Birkirkara, aged 84, comforted by the rites of Holy Church. He leaves to mourn his loss his wife Manuela, his nine children Carmen, widow of Ninu, John and his wife Josette, Albert and his wife Marisa, Raymond and his wife Lucienne, Michael and his wife Catherine, Noel and his wife Nathalie, Jeffrey and his wife Rose, Joseph and his wife Donatella, and Tania and her husband Emanuel, his grandchildren, his sister-in-law Lora, widow of Karmnu, nephews, nieces, other relatives and friends. 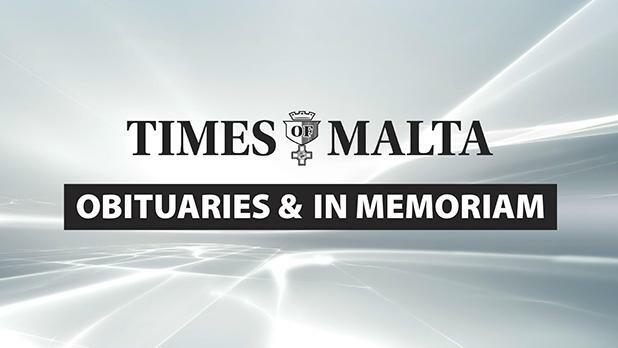 The funeral leaves Mater Dei Hospital on Thursday, January 24, at 8am, for St Helen’s Basilica, Birkirkara, where Mass præsente cadavere will be said at 8.30am, followed by interment in the family grave at Santa Maria Addolorata Cemetery. No flowers by request but donations to Id-Dar tal-Providenza, Siġġiewi, and Hospice Malta, Balzan, will be greatly appreciated. Lord, grant him eternal rest. AGIUS. Please pray for our mother JANE, née Griscti Soler who died 30 years ago. So fondly remembered by the families of her children Edith, Astrid, Dennis and Ingrid. BALDACCHINO – MARY. In loving memory of a dearly beloved wife, mother and grandmother, today the 11th anniversary of her demise. Fondly remembered by her husband Lawrence, her children Albert, Lorraine, Doreen and her husband Victor, and grandchildren Rhys, Dylan, Rebecca and Owen. Lord, grant her eternal life. BALDACCHINO – MARY. Loving and treasured memories of a dear mother. Fondly remembered on the 11th anniversary of her passing away to a better life. Always remembered with love and affection. Your son, always, Albert. GLANVILLE. Remembering our dear father FRANCIS, today the anniversary of his death. Always in our thoughts. His children Lina, Bernadette, Joe. GULIA – FRANK. Remembering our dear father on the 35th anniversary of his demise. Always in the thoughts and prayers of his children Antoinette, John, Simone and their families. RAGONESI. In loving memory of our dearest RENÉ, today the 20th anniversary of his passing away. Always in our thoughts and prayers. Tania, Anita, André, Roberto and Joanna, Carlo and Sharon. May he rest in eternal peace. RUTTER GIAPPONE – ROSE, née D’Alessandro, widow of Antoine. On the fourth anniversary of her demise. Fondly remembered by her son Anthony and his wife Anne, her son-in-law Mario Rosario Bonello, her grandchildren Nicola and her husband Malcolm Borg, Karen and her husband Matthew Gatt, Sarah and her husband Ian Critien, and Krista, and by her great-grandchildren. SHEPHARD. In loving memory of WILLIAM, today the 19th anniversary of his death. Remembered with pride and love by his daughters Mary and Lilian, widow of Lino Maistre, his grandchildren Bryan Maistre and his wife Jackie, Sharon Maistre-Welsh, John Maistre, and his great-grandchildren Georgina, Eunan, Carla, Luke, Jamie and Megan. Please remember him in your prayers. SULLIVAN. Treasured memories of GEORGE on his 21st anniversary, today and always.